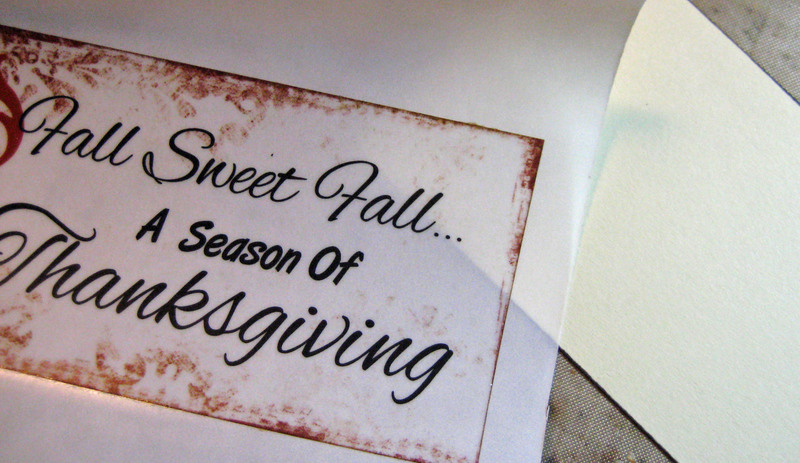 In honor of Xyron’s partnership this week with Quick Quotes I made a fall-themed gift bag full of greeting cards. I don’t know about you but I’m always in need of just the right card to send for birthdays, a quick thank you, or just a card to say ‘hi.’ This great little gift is self-contained: five cards, five envelopes, stamps and all tucked neatly into a coordinating gift bag! It’s a breeze to create, especially when using coordinating paper packs like the Cherry Truffle pack I used from Quick Quotes. 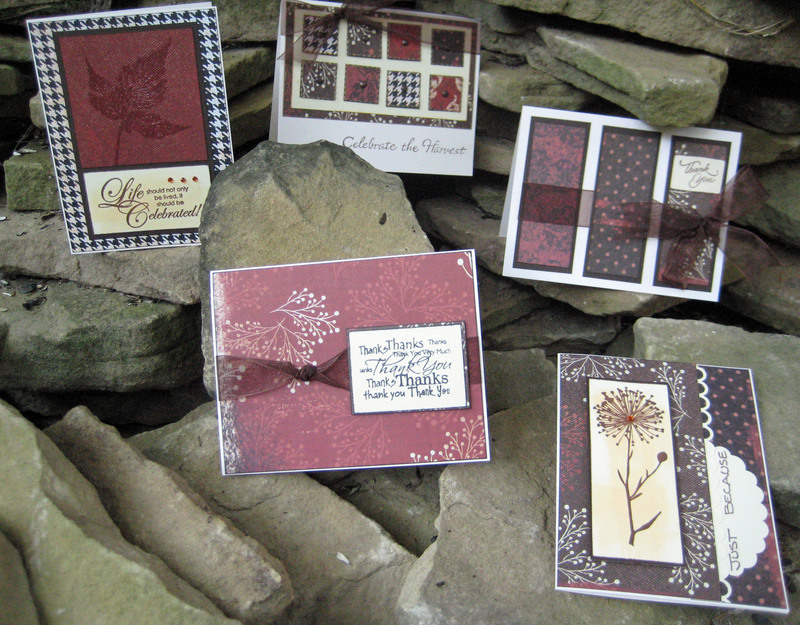 I began by making five cards, all with different sentiments to cover several occasions. A few have some unique features to them, just to add a little special touch here-and-there. 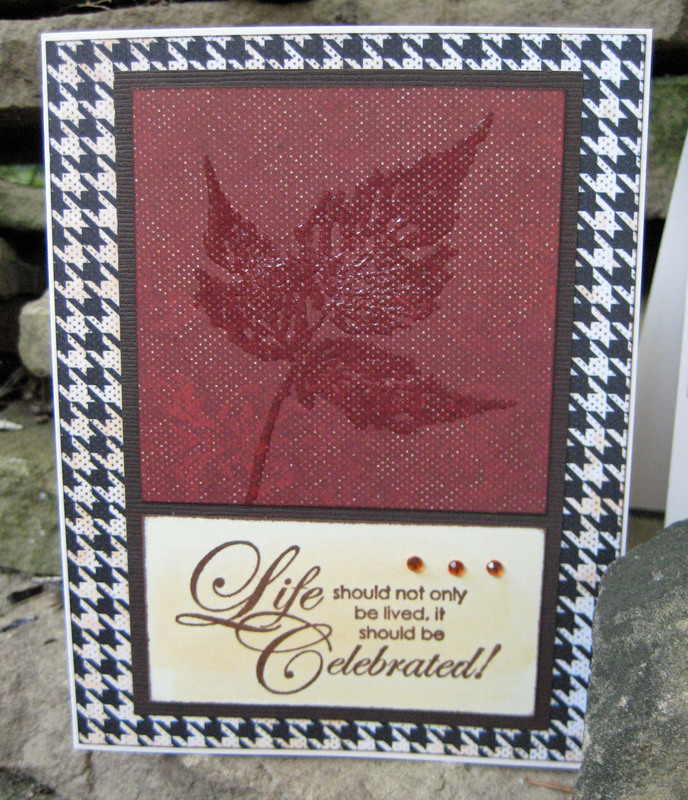 On this ‘Life’ card I used a Fred Mullet stamp, clear embossing ink and ultra thick clear embossing powder. By using the clear embossing ink and powder it lets the beauty of the paper show through while giving a look and feel of dimension and texture. The sentiment is stamped in Ranger Coffee Archival ink, heat set and then I spread Dried Marigold Distress ink on my non-stick craft sheet, spritzed it with water and lightly brushed it over the sentiment to add a hint of color. Love the final results! 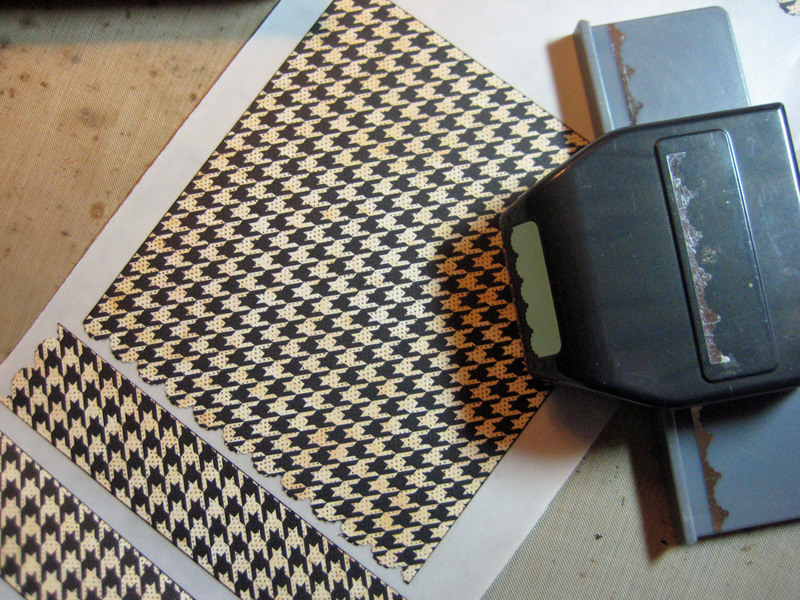 I’ve always loved the concept of incheys but don’t have the patience to decorate those small 1-inch pieces of paper so I take the easy way out by punching scalloped squares with an old punch from McGill. 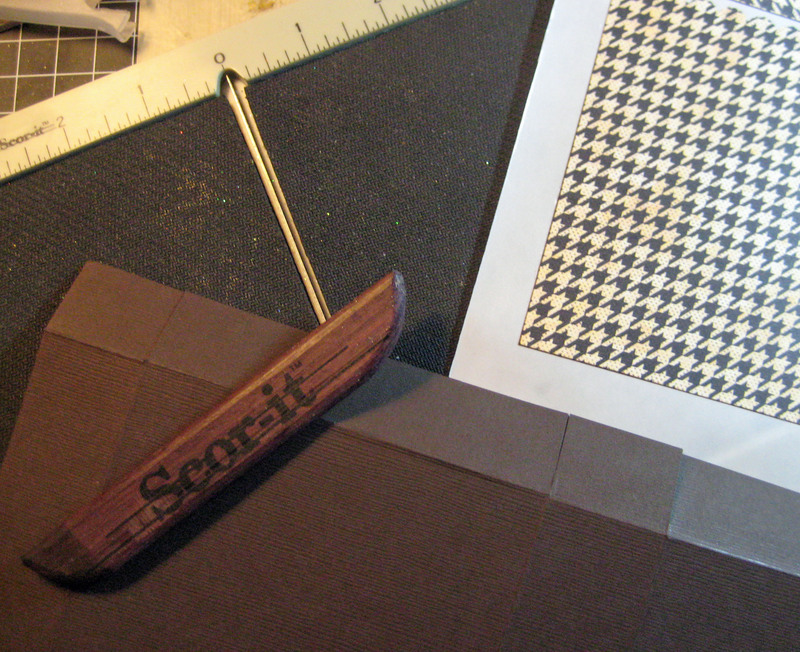 It’s a 15/16″ and I back it with a 1-inch square punched coordinating cardstock. 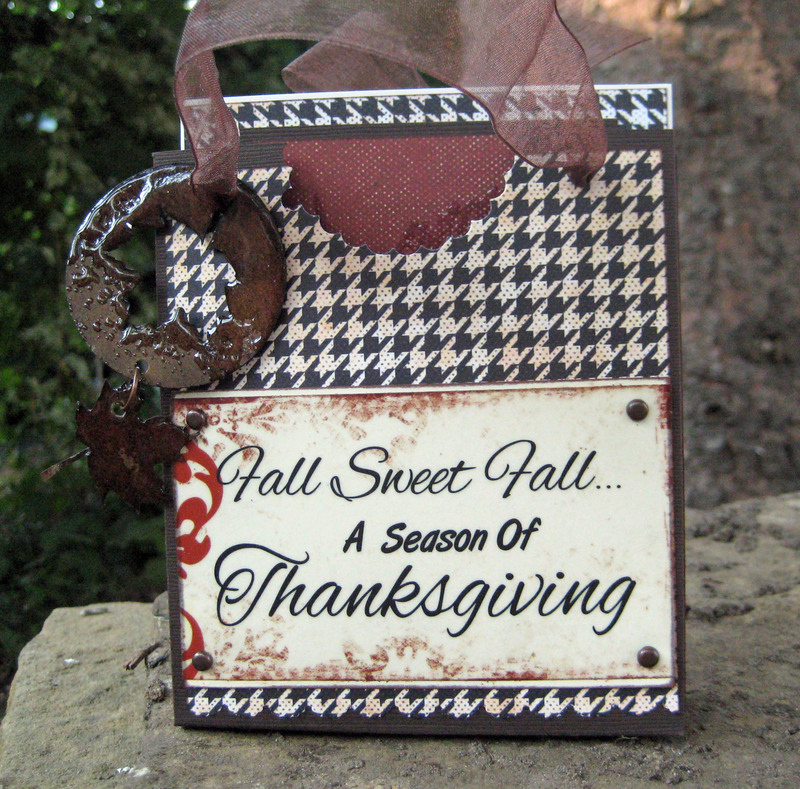 I love the look and have used it many times on cards and scrapbook pages. On this card the scallop square is punched from papers in the Cherry Truffle line and edged lightly with Ranger Gold Acrylic Paint Dabber. I run all the squares through my Xyron 1.5″ Create-a-Sticker, stack them together, place them on the background then pierce through the center and brads in each one. Here’s a look at all the cards that fit inside the little bag. The bag is made from one sheet of 6X12″ cardstock and is decorated using the Cherry Truffle papers, scallop border punch and Xyron 5″ Creative Station. I finished it off by adding a vellum quote from Quick Quotes processed through the 5″ Creative Station. I love Xyron machines for vellum papers. The adhesive totally coats the back of the vellum so nothing shows through except the background paper – as it should be! I sprinkled some clear embossing powder to a couple pieces from the Quick Quotes Bag o’ Chips after heating them with my heat gun and then melted the powder. By not using ink it gives more of a random look, which is what I like. These are dangled from the ribbon handle. All that’s left to do is insert the cards, envelopes and stamps and your gift is ready for presentation! Thank you Deb and it’s so nice to hear from you! Glad we’re able to find each other again! 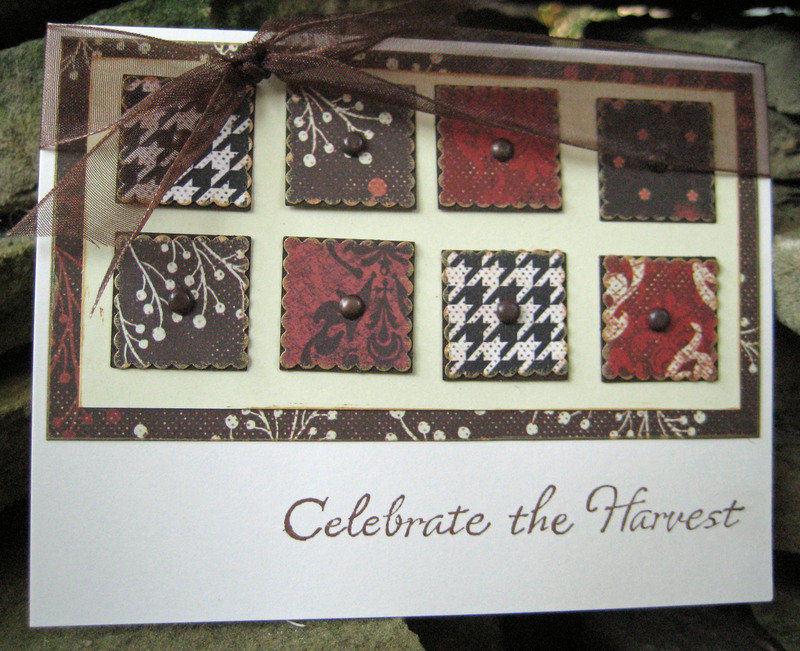 I love your faux “inchies” card….such a great layout and could be used with any kind of “event'” paper. When is the Somerset magazine coming out? I have been stalking Joann’s every darn day….and they still have the Summer issue. It is the September/October issue, right? I love using those faux inchies too Kaye! Sommerset Studio is already out at Barnes & Noble; should be at Joanne’s and Michaels Sept. 1. Great job as always….I am with you I never have enough cards made up!